Preheat oven to 400. Cut your bacon slices in half. Use 2 pieces of the cut in half bacon and shape them into a heart on a sheet pan (make sure this pan has sides so the grease doesn’t get all over your oven!). Bake for 18 – 25 minutes (or until done). Serve however you’d like for your loved one. Extra credit if you dip the bacon in chocolate! Yum! 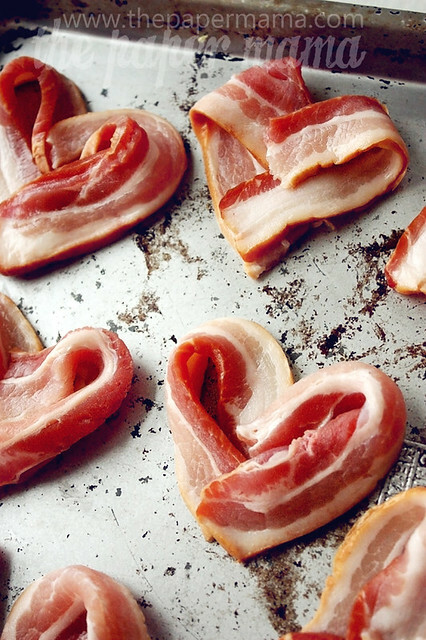 This year I think I’ll put these bacon hearts on a yummy homemade ceasar salad. I do hope you enjoy! P.S. Even the pioneer woman liked my bacon hearts… that made my day. Woo hoo! Let me know if you’ll be making these! Here’s the original post if you’d like to check it out. I love the heart idea but I don’t like bacon. Do you think I will still be able to make this? Does the pan need to be greased? I tried these and they totally stuck to the pan and broke to pieces. I thought they'd produce enough on their own. I want it to work so bad! I've never greased the pan, but maybe you could give it a try? If you use thin bacon it may break easier. I have a store we get our bacon and it's always thicker and floppy (perfect for bacon hearts). would chicken bacon work or does it have to be original bacon? thanks! Once the bacon is baked, does it hold the heart shape? Hmmm… well, this will depend on the type of bacon. I have had issues with some bacon being too… tough? It wouldn't hold it's shape. You'll need floppy bacon. That will work best. Press the intersected bacon heart parts together. Baking should "glue them". BUT, I feel if you're dipping them in chocolate you might want to use a skewer to hold it together. Soak your skewer in water for about an hour (so it doesn't burn in the oven) and skewer the intersected bacon parts. Bake. Dip in chocolate. I hope that works! Good luck! My nine year old daughter and I are making these for my husband this morning for breakfast. He will love them!! Thanks for the idea! Do you think this tecnique words for the bacon roses, too? I want to make both for my husband. Made these tonight and they were a huge hit. Thank you! Cant do it this morning I work third she works first, have to make them this weekend to make up for it. I made these bacon hearts for my hubby's Valentine's Day breakfast. You can see that post here. I linked to you! I made these this morning along with heart shaped pancakes and heart shaped eggs. Sadly I overcooked the bacon and they came out as very small crispy hearts. Oh well next time I will turn the temp of the oven down. My boyfriend still appreciated the effort. Thanks for the great idea! I tried. I failed. Then again, I tried on the stove top. I couldn’t get good shapes. But honestly, who is going to reject bacon in any shape?? I am making these tomorrow morning for breakfast with heart shaped pancakes, strawberry jelly and strawberries cut in half 🙂 Thank you! Heck yeah! Those are awesome!!! I love chocolate covered bacon. Yum! This is going to make my boyfriend’s morning on VDay! So excited. These are awesome! My hubby is going to be THRILLED when I make them for him. I host a weekly meme called Thematic Thursday. Each week has a theme and this would be perfect for this week’s Valentine’s theme. I have bacon in freezer that I meant to cook up, but never did (I'm not a fan of cooking bacon). I'm so excited to finally cook it up on Valentine's day! This looks nice and simple and my husband will love it! That looks amazing. So trying it tonight. what a great idea, I am going to make this for my 5 year old who loves bacon and all things "heart" shaped 🙂 Thank you for sharing! Who knew bacon could be cute?! My local pizza shop is selling heart shaped pizza pie! I think the bacon hearts will be an amazing topping!! Thank you! Heck yeah! A lovely addition. Ummm I'd actually like to be given a plate of these myself, haha! Great idea! My hubs would love this! Now I just need a woman to make me these next week . . .